Collision/Comprehensive Deductibles: Uber allows for a $1000 deductible while Lyft’s deductible is $2500. If the UberEATS driver is on the clock, meaning the app is open and available, but before or after any food requests, then the $50,000 per person and $100,000 per accident and the $25,000 of property damage coverage should be available. 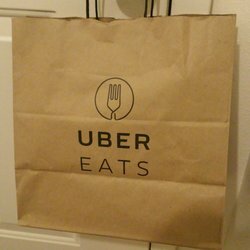 How to Find Out If UberEATS was Involved in Your Car Accident? In some car accidents, you can tell that the other car was an Uber or Lyft vehicle. Some Uber drivers have stickers on their windows. Lyft drivers may have the pink mustache on the car. If the Uber or Lyft car is not clearly marked, odds are the driver and/or passengers will say something. But if it is an UberEATS driver you can’t question a bag of food. There is also a chance that the UberEATS driver will not want to admit that they were driving for UberEATS out of fear that they will be suspended from future trips because of an accident. So, what do you do? Your Uber accident lawyer or Lyft car accident attorney can help. The lawyer can send a formal letter to Lyft and Uber demanding that they disclose if the other driver was working with either company at the time of the accident. The attorney can also conduct an in-depth investigation into all possible avenues of recovery through public records, discussions with the investigating officer and attempts to speak directly with the other driver or his/her representative. Ultimately, the other driver should be made to understand that it will be in their best interests to have the insurance coverage that UberEATS might provide. At the Wolfson Law Firm, our Miami Uber accident lawyers and Lyft injury attorneys have helped all kinds of car accident victims in South Florida since 1963. Our personal injury legal team understands what to do and how to help you after your Uber, Lyft or UberEATS accident. We offer free consultations at our offices in Miami, Fort Lauderdale and West Palm Beach. Just call us today at (855) 982-2067 or (305) 285-1115 and let us answer your questions.